Imagine clearing away the fragments of your life, clearing away the clutter, to achieve the next stage of your life. Imagine living the compelling future you desire, one which provides you with the freedom, independence and the quality of life you desire. Why the Strategic Life Management – Building Results Program? Bringing your dream alive requires you to continually build and take action, until you have created the vision for real! Once you’ve laid the Life Management Foundations of what you aspire to, the next step is to breathe some real life into your plan and begin building and progressing results. We help guide you towards actions which consistently implement and reinforce success habits. You will be implementing strategies which save time, energy and money to accelerate and manifest your dreams into reality. We will continue to work with you to maintain momentum, resolve issues as they appear, maintain motivation and focus, and identify blind spots that may be interfering with your success. 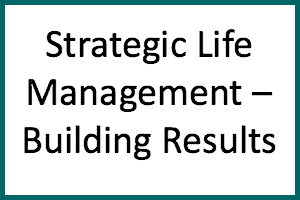 What is the Strategic Life Management – Building Results Program? Strategic Life Management is about creating a compelling future of possibilities based on your individual passions, goals, values and visions for the future. It is inspired living which encourages your individuality to shine through and thrive in your Business and Personal life. Once the foundations have been laid for your future success, consistent habits are required to build that future. It takes 21 days to develop a new habit and 90+ days to cement it. Therefore you need to be consistent in your thinking and actions to long enough for the new habit to become normal for you. New strategies and patterns may need to be adopted in other areas of your life to reinforce the new habit. Consistent actions will assist you to enjoy clear thinking, vibrant attitude and quality of performance – each of which wlll support you in achieving the successful outcomes you desire. Implementing strategic actions of your personal plan needs to be performed consistently in order to reach your goals. Streamlining plans and strategies is an ongoing part of attaining what you want. You must keep on track with your actions in order to maintain active momentum. Progressing your goals requires continued focus, decisions making, and taking consistent actions. We will assist you to save you time, energy and money as you face challenges along the way. Succeed in attaining your Business and Personal goals by actioning the essentials required to empower and progress your goals. Make a commitment today that you will do what ever it takes to succeed – you deserve to have what’s in your heart and mind. Our coaching sessions are tailored to deal with your individual desires for achieving success, what ever success is to you. So your program is relevant, specific and targeted at the success you wish to achieve.